When Macworld first reviewed Google Earth for the iPhone two years ago, the reviewer came away mildly disappointed with the app, which quite literally puts the world at your fingertips. The review concluded the mobile version lacked certain key features that its desktop counterpart offered. Zooming around the world, finding points of interest, or spotting a close-up satellite view of your childhood home are all fun enough, the review suggested, but without integrated features from the desktop tool like driving directions, personal placemarks, and clever layers, the iPhone version came across as an underpowered younger sibling. Now that Google has chosen to revisit Google Earth, making it available for the iPad as well, we’re taking a second look at this free App Store offering. I was eager to see how many of those initial disappointments had been addressed in Google Earth’s latest iteration. The answer: Not a one. The cool stuff in Google Earth remains cool: You really can tap in any address and see impressive satellite views, and you can zoom, if you wish, into highly over-pixellated angles. You can flick your finger to cover thousands of miles in an instant; you can drag with two fingers to adjust your angle. The app can smartly auto-complete addresses from your contacts. 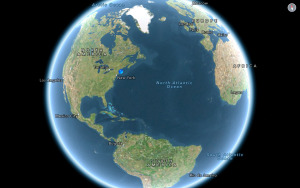 Points of Interest: Now running natively on the iPad in addition to the iPhone and iPod touch, Google Earth still suffers from many of the same old problems on Apple’s iOS device. 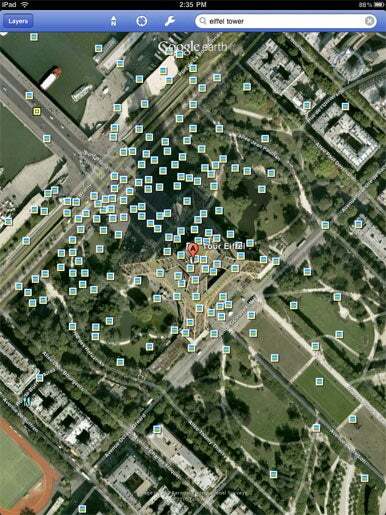 Here, there are so many icons for the Panoramio photos layer, they almost obscure the Eiffel Tower. When you’re focused on a specific spot, you can re-use the search field to look for restaurants, parks, or other nearby places, all of which then get highlighted. Tapping on any of those locations exposes a small popover window with the spot’s address and phone number, along with a Web link, which you can open within the app. That link is to Google’s search listing for the spot in question. And that’s where the problems begin. You can tap on a Google link for directions, which open on an embedded Web page within the app, instead of using an integrated approach like the Maps app. Occasionally, when I clicked for directions within the nested Web page, the app abruptly crashed on my iPad. When you’re looking at even a moderately-dense city, Google Earth’s layers feature quickly approaches unusability. The layers the app offers—for places, businesses, Wikipedia entries, borders, roads, terrain, and Panoramio Photos—are all helpful at times, but in practice they’re tough to use. Looking at the Eiffel Tower with the Panoramio Photos layer turned on is futile; the tower and its environs are overrun with tiny picture icons, like a flock of square birds obscuring what would otherwise be a great view. To Google’s credit, the latest version of the app does address one of the complaints in our earlier review: It’s now easier to navigate when many layer icons are stacked on top of each other, because tapping one reveals a scrollable list of all the nearby points you may have been aiming for. As I mentioned out the outset, some of the most useful layers from Google Earth on the desktop still haven’t made the jump to iOS. It’s a shame, really, that the iPhone app can’t access traffic views, weather, or street view information, all of which seems more useful to me on-the-go than at my desk. I found that Google Earth’s “auto-tilt” feature—which theoretically lets you navigate by moving your iPad or iPhone around—is rather frustrating to use, moving your view precisely where and when you don’t want it to. In the latest version of the app, the feature wisely defaults to disabled, and I’d recommend that you leave it that way. Google Earth is free, and at that price I can’t deny the app can amaze you with the level and quantity of data it exposes. But the iOS version of the software really pales in comparison to the desktop version, with bizarre omissions of seemingly perfect-for-mobile features. Instead of adding extra power to the iPad version of the app, Google simply blew up the iPhone version to a larger size. Both versions are nice enough to play with and show off to friends, but wind up falling disappointingly short of being genuinely useful.